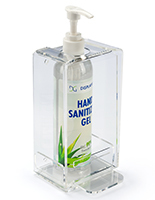 Looking for hand sanitizer stands and holders to protect clients and patrons from transferring germs when they visit your establishment? 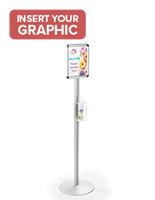 Anti-bacterial gel and foam dispensing stations have been proven to help reduce the spread of infection-causing bacteria in public environments. 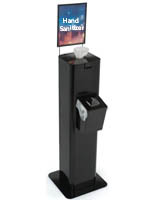 Our hand sanitizer stands for floor, counter, or wall mounting are available in contemporary acrylic or wood styles to match any decor, from grocery markets to car dealerships to museums, law offices, and hotel lobbies. Recent concerns about airborne illnesses and potential epidemics including flu, colds, and ebola make these fixtures a must-have item when organizing a professional or commercial public space. These hand sanitizer holders, also known as Purell gel dispenser stations for germ prevention, help maintain a health-conscious environment for customers, visitors and patrons. 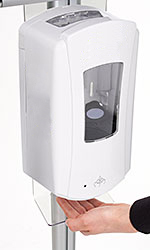 Due to the sensor technology, these units provide a safer alternative to wet wipes because they minimize human contact. 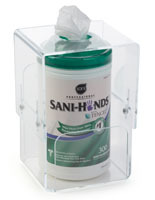 These inexpensive touch-free hand sanitizer stands help kill the bacteria that gets transmitted from person to person. Place these freestanding supplies in schools, cafeterias, banks, hospitals, pharmacies, health centers, gyms, public rest rooms, restaurants, grocery stores, professional offices, and libraries. High quality hand sanitizer stands with touch free anti-bacterial gel dispensing technology help keep the Purell dispensers free from cross contamination. What features distinguish these professional-grade touch free Purell dispensers from others on the market? Our Disease-preventing hand sanitizer holders are modern, durable, and stylish. Commercial quality fixtures come in clear acrylic, or hard-to-find wood w/ black acrylic accents. Antibacterial gel stations come in floor, countertop, or wall mount styles, and include mounting and installation hardware. High quality stylish wooden stands easily match upscale decor in healthcare venues, hotels, & offices. 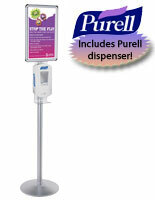 High quality commercial Purell dispensers are available countertop, freestanding and wall mounted configurations. Typically the standard acrylic models with brushed silver aluminum finish look modern and clean in institutional settings, while the wood models are suited to more upscale venues. 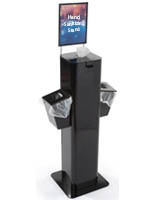 Some of these Purell dispenser systems, also known as gel pump bottle mounts, are floor standing and weighted at the base for stability in high-traffic areas. Some of the acrylic stations have a built-in tray to catch run-off. Wood models are hard to find, and we are happy to offer them at this website for more décor-conscious spaces like museums or hotels. These touch free systems with motion sensor technology powered by alkaline batteries dispense just the right amount of foaming soap or gel. Liquid levels can be seen through a large window to alert staff when the gel pump bottle is running low. Some receptacles are equipped with snap-frames in portrait orientation for messages reminding people to wash so they will not transfer germs. Space-saving counter stands have rubber feet and/or locking screw or bolt to keep the unit stable on a health clinic desk. The hard-to-find holders are those with real wood facing in golden oak, red mahogany, or cherry, with black acrylic trim to house gel pump bottles between 8 and 12 oz. The freestanding design of some of the containers looks stately in hotel or office lobbies. The quality touch free stands pictured here for floor mount have a weighted base to keep the presentation stable, even in area of high traffic. Low-profile supplies like these hand sanitizer stations add style to the décor. A holder for bacteria prevention is a safe and affordable way to reduce risk, without diminishing the style of an office or venue. 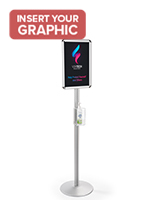 These displays are must-have items in areas where lots of people gather because the hand sanitizer stations keep them safe without ruining the decor. Who knew such beautiful stands could do much to kill bacteria and protect the health of patrons and visitors!